This is bass amplification at its purest; a powerful amp and single driver in a well designed, solid cabinet. Simple to use, well made, awesome traditional sound. Pretty heavy for a small combo; no FX loop. Orange seems to be on a roll at the moment. The distinctive amp and cab designs with their 60s sci-fi pictograms and heraldic crests look cooler than ever. They're also very well made and sound awesome: a serious alternative to that other venerable British amp maker. 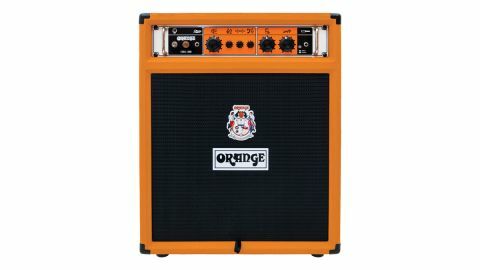 When you see an Orange bass stack standing menacingly at the back of a dark stage before a gig starts, you know it's going to be loud and it's probably going to be overdriven. Excellent. The problem is, we don't all have the space in our lives for a huge stack: wouldn't it be great if we could get the same classic tone from something a bit more manageable? The recent resurgence in the popularity of the 1x15 combo has been made possible (at least in part) by the improved design and spec of modern 15" speakers. The driver in this particular combo is an 8-Ohm Eminence neodymium, a high quality and lightweight but powerful unit capable of reproducing a wide range of frequencies at very high levels. Housed in the compact and solid front-ported cabinet, it's the perfect partner for the OB-1 amp unit. And what an amp it is. 300 watts isn't massive for a bass amp these days, even a combo, but this is no class D 'fits-in-your-gigbag' job. It's based on the mighty rackmount OB-1 amp and has the same heavy-duty all-analogue 300W class A/B power amp section. It features a bi-amp inspired signal path, where the signal from your bass is split in two, half going to the power amp section and half to the gain stage, where it can be overdriven and then re-integrated with the clean signal using the blend control. The front panel is divided into three main sections. On the left is the on/off toggle switch and status light, and next to this a footswitch input for switching in the gain. Any standard latching footswitch can be used. The middle section features an oversized chunky volume control and next to this, a simple three-band EQ. Despite appearances, the EQ actually sits in the signal chain after the gain stage. All three controls (bass, middle and treble) are of the Baxandall design, so that with the controls set at 12 o'clock, the signal is effectively flat. Turning them either anti-clockwise or clockwise will cut or boost the frequency by plus or minus 15dB for the bass and middle, and plus or minus 20dB for the treble. That's a lot. The last section is a gain stage and has just two controls. One boosts the upper frequencies and harmonics and the other is a blend control, allowing you to add as much of this effect to your existing sound as you wish. It's hard to see how any amp could be easier to use, but the impressive thing is that despite this, it still manages to be incredibly versatile, as we shall see. On the far right of the amp is the single input with an active/passive pad switch. We tested the OB-1 quietly in the studio, and unsurprisingly, it sounded fine, but for real-world appraisal it needs to be used as intended. So for the next week it was our sole amp for both gigs and rehearsals - and we have to say, it really delivered the goods. On a purely practical level, although the neodymium driver does much to help keep the weight down, with such a solid construction and 300W analogue amp it's pretty hefty, especially for those of us used to carrying around compact lightweight cabs, neodymium drivers and digital amps. In use, one of the major strengths of the OB-1 is its refreshing simplicity. Once plugged in and switched on it's just so intuitive to use. But the two recessed bar handles mitigate this to a large extent, and moving it from car boot to stage isn't as much of a challenge as it might have been, had the whole design not been so well thought-out. Of course the upside is that the combo has a solidity and focus to the sound that would be unthinkable with small speakers and a flimsy cab. In use, one of the major strengths of the OB-1 is its refreshing simplicity. Once plugged in and switched on it's just so intuitive to use. Getting 'your sound' using the basic three-band EQ takes just a few moments, and while you're doing so you'll discover that there are no bad sounds here, even at the extremes. Once you're happy with your basic sound, you can turn your attention to the gain stage. Even with the blend control fully off, turning up the gain control still has a subtle effect to the sound, fattening up the harmonic richness of the top end and mids, while leaving the lowest frequencies pretty much unaffected, and of course it does this without any increase in volume. However, turning up the blend control certainly does add volume: it needs a careful hand or you may find the level of overdrive too much. That said, the sustain and harmonic feedback available when the taps are really opened up is great fun to experiment with. But for a bright, clanging and usable overdriven bass sound, we found that the gain set to the second notch and the blend on by about a quarter was more than enough, especially with the master volume turned right up - although it's good to know there's plenty more available, should you need it. Adding in a bit of overdrive with the blend control or the footswitch like this really shows off what's best about the OB-1. With an old passive Jazz or Precision - or perhaps better still, a contemporary version of either - you instantly have what must be close to the definitive rock bass sound. But this is bass amplification for the real world and as great as it sounds while you're adjusting the EQ and sorting out your sound, it's only when you're mid gig, playing hard and locked in with the drums and guitars that you can really appreciate just how good it really is. With an active five-string plugged in and the gain blend backed off, the sound is clean, full and rich, a modern, compact interpretation of those big valve stacks of the 60s and 70s but without the inevitable hum, feedback and crackles that came as standard in those days. The absence of a HF driver or tweeter means that you lose a little sharpness right at the top end for slap or harmonics at high volume, but this is countered by the focused warmth of the sound. With the increasing prevalence of super-compact, lightweight class D digital amps it's easy to forget just how good some of those old class A/B amp designs and 15" drivers sounded. The OB-1 combo takes the essence of that sound and style and brings it bang up to date, making it work for whatever kind of bass guitar or style of music that you play.